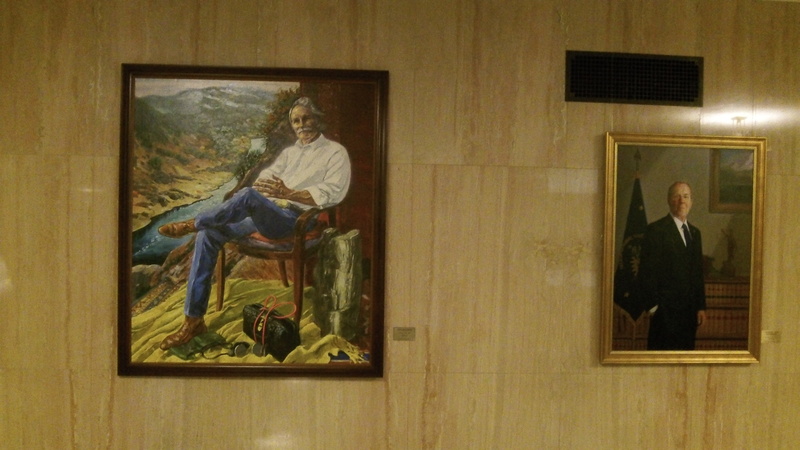 Kitzhaber’s official portrait dwarfs that of his successor and predecessor. John Kitzhaber was not at the Capitol on Tuesday, as far as I know. But his portrait was, hanging on the wall just outside the main entrance to the chamber of the Senate, where he served many years and did his best work. Tuesday was Kitzhaber’s last full day as governor; his resignation under fire takes effect at 10 a.m. Wednesday. And now that he’s going to be out of the picture, even critics may feel bereft. In the Senate, Kitzhaber sponsored what came to be known the Oregon Health Plan. The general idea was that it would cover people up to a certain income limit with health insurance, but the better idea was that it would cover only treatments and procedures that actually worked. There was a list of things that would be covered. The list was changed from time to time, and I’m not sure whether it was ever strictly observed. One big part of the initial idea was that as the government covered the poor, employers would cover people with jobs. That part, alas, was never enacted, which reduced the Oregon Health Plan to just another version of the federal Medicaid program. Kitzhaber continued promoting a better way of providing health care and insurance. What if, he asked when he was out of the governor’s office during the Kulongoski interim, what if the country pooled all the money now spent on health insurance by government and the private sector and used it to cover everybody, concentrating on treatments shown to be the best in actually bringing out better health for almost everybody. One day he gave a talk about his concept in Salem, and I drove up to hear it. Afterward, he sat down with me for an interview to explain in detail what he had in mind. I don’t remember all the details now, but I remember being impressed and saying so in an editorial in the Democrat-Herald. If his concept had been carried out, chances are it would have become just as complicated as Obamacare turned out to be. But it might have worked without threatening people with fines and the IRS if they failed to get insurance. Good article, Hasso. Kitz has his good qualities, like most everyone, despite his politics. What has happened to him is not uncommon in people with too much power for too many years. Perspective lost, followed by poor decisions and ultimately, this disgraceful exit. Whether driven by power or “love,” or both, doesn’t seem to matter now. The legal process will run its course. I am reminded of my grandmother’s admonitions to “be careful what we wish for.” It seems many in the conservative camp take much joy in the fall of people like Kitzhaber and Brian Williams at NBC. I too am glad they are both gone, but when we start wishing ill upon others and take joy in their demise, self inflicted though it is, we must be careful of the bad karma that can result if taken to extremes. What goes around, comes around. In Kate Brown we didn’t get a Governor any closer to the center than we had before. Likely farther to the left than Kitz. Her loyalties to the public employees unions are well documented, and we hold the distinction now of our Governor being a proud member of the LGBT community, instead of the “Marlboro man” outdoorsy type that many could identify with regardless of his politics. Governor Brown deserves every opportunity to do what’s right for all Oregonians and she deserves our initial support in that effort. Let’s hope she is more “open and forthright” in her governance and the way she does the State’s business. I’m not real optimistic but time will tell and I’ll reserve judgment for now. The Oregon healthcare exchange is a huge fail. “Employers covering people with jobs” was a huge fail. Lawsuits, corruption, despotism, flaunting laws passed by the people, wasting huge amounts of money on failed programs, and he’s practically revered? It’s true Jim, you don’t understand. Never will because he can’t! Yeah, Bob….Let’s all get your “take” on it all. It’s easy to throw rocks……. The only thing missing from that cornball official portrait is the dog. Can’t be a true man of the people without that!